This prestigious Breiz'île spiced punch, is made with old agricultural rum from the Caribbean, passion fruits, pineapple and spices. This prestigious passion and pineapple spiced punch, is one of the four flavours of Breiz'île Collection released in limited edition. 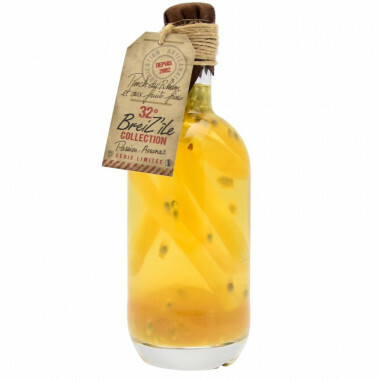 This Breiz'île rum is made with old agricultural rum from the Caribbean, 10% fruits and spices. With its beautiful minimalist bottle that perfectly highlights the rum and its percentage of 32° ABV, higher than the traditional range of the company, this expression offers novelty with passion fruits and pineapple and still evokes the best alliance between the sunny Caribbean islands and Brittany hospitality. Handmade in Brittany, combining strength and sweetness, this drink may be enjoyed both as aperitive and digestive. You may store it out of the refrigerator. Breiz’île is a craft range of spiced punches elaborated in Camaret, Brittany. Everything started in 1997, in the fishing harbour of Saint-François, Guadeloupe. The “Brethren of the Coast” is then composed of three Bretons: Ronan, Olivier and Alain. They founded their restaurant and cooked delicious fish meals celebrating spices and rum. Three years later, they opened a second restaurant in Camaret-sur-Mer, thus forging a connection between Brittany and the Caribbean. Everything is handmade in the Camaret-sur-Mer restaurant. Fruits are chopped and macerated with syrup, spices and white rum from the Caribbean. After two months macerating, we discover a smooth punch with a subtle fruit taste and a delicious vanilla flavour. Ingredients: rum, water, syrup, fruits, spices.